Apple has integrated 3D Touch into its own apps on iOS, giving users the ability to do take action on different types of information and content. When iOS 9 has identified information including such as package tracking numbers, flight numbers, dates, times and links, it can provide a preview to show up as underlined text. Using 3D Touch you can peek at the information, instead of tapping on it and launching the proper app or opening another screen. Now let’s see what you can do with this fascinating feature of 3D Touch. While typing any message or email using the iOS keyboard, just lightly press on the keyboard with one finger and it becomes a trackpad of sorts. Just slide your finger around to move the cursor. If you want to highlight text, just press a little harder while continuing to slide your finger. This might be the coolest feature of 3D Touch. 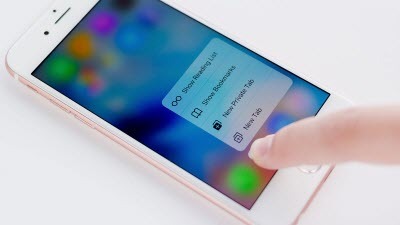 With 3D Touch, you can now initiate a Quick Action by opening an app directly to the particular section you want. Just hard press on an icon from your home screen for a pop up of options that you can select as a shortcut to the specific action. For example, instead of pressing the Phone app icon to open the app and navigate to the contact for your spouse, you can simply hard press on the Phone app icon, and select your spouse from the popup menu to make that call more efficiently. The turmoil of trying to precisely place a cursor in order to fix a typo is ever-present. With 3D touch, you can slide around the cursor with a much clearer view of the text you are editing. The selfie-inclined are going to love this one especially, but it’s handy for specific types of image capture. Take that, fleeting moments! If you’re an artist, you will especially like the pressure sensitivity when drawing something in the Notes app. You will notice that the line thickness changes as you apply more pressure on the display. A light touch will give you a thin line, and pressing harder will add thickness to it.